When you want instant hot water at the master bathroom sink, nothing beats an under-sink point-of-use mini water heater. Stop waiting for hot water! A point-of-use water heater delivers it instantly. An instant, point-of-use water heater is a small electric water heater that immediately supplies hot water to a single fixture or two. 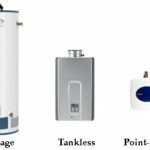 This type of mini water heater solves problems where you have to wait for warm or hot water—often in situations where the main home water heater is located a long way from a sink you use frequently. Consequently, a point-of-use electric water heater often makes sense in a remote master bathroom, a wet bar, patio kitchen, office, boat or RV. Note: This appliance is different than a hot water dispenser used at the kitchen sink. For information about a hot water dispenser (the type with a spout that mounts next to your kitchen faucet), please see the Instant Hot Water Dispenser Buying Guide. Point-of-use water heater stores up to 2 1/2 gallons directly below the sink. A point-of-use mini water heater may either heat water as it flows through the device, or heat and store from 2 to 7 gallons of water, depending upon the model. These two main varieties differ in that a flow-through point-of-use mini water heater will heat a small amount of water endlessly whereas a storage model will heat from 2 to 7 gallons of water that it will serve up in a heavy flow until the tank runs out. Then it will reheat a new tankful of water in a few minutes. Some plug into a standard 120-volt electrical outlet, though manufacturers sell 240-volt models, too. Depending upon the size and wattage of the unit, electrical upgrades may be required. Plumbing connects directly to the cold-water supply and hot-water pipe or faucet. These units are compact in size. Most install in the cabinet under the sink or very near it. They stand on the floor or cabinet bottom or mount to a wall or cabinet side with a bracket. 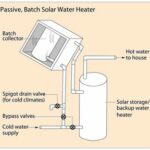 Why Buy a Mini Point-of-Use Water Heater? Mini point-of-use water heaters save water and energy and offer comfort. If you must wait a few minutes for warm water to arrive at your bathroom sink when you’re washing your face, you often end up either wasting a lot of water or washing your face with cold water. An instant, point-of-use water heater dramatically speeds up the delivery of hot water to the sink because it heats the water right at the sink. Flow-through mini water heater is very compact and tankless. Hot water traveling from a conventional water heater to a sink will cool in the pipes on its way to the faucet. As a result, it wastes the energy used in heating it. Similarly, when you shut off the hot-water faucet, hot water stays in the pipes, losing its heat over time. A mini point-of-use water heater eliminates that wasted water and energy. In addition, because you don’t have to let the water run while you wait for it to heat up, it also saves you time and frustration. 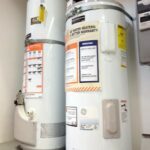 Storage-style point-of-use water heaters are rated by their water capacity and recovery rate (the time needed to heat a tank full of water to 90 degrees). 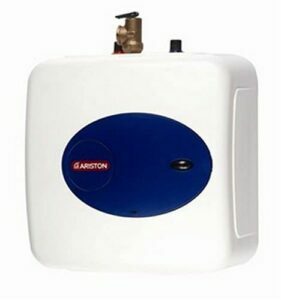 Flow rate determines how many gallons per minute (GPM) of water a tankless mini water heater. Typical flow rates run from .5 GPM to 2.25 GPM. 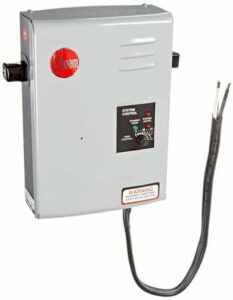 Top selling flow-through under-counter electric water heater delivers 4 gallons per minute, must be hardwired to 240-volt circuit. Generally speaking, the more expensive the appliance, the greater its capacity and recovery or flow rate. Manufacturers typically produce a line of products at varying price points, capacities, recovery rates, and flow rates. 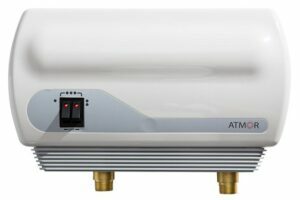 Atmor offers a range of point-of-use water heaters from the AT-900-03 that delivers .5 GPM to their AT-900-13 that supplies 2.25 GPM, enough for a sink and shower. Typical sizes for storage mini water heaters are 2.7-gallon, 3-gallon, 4-gallon, and 7-gallon models. Prices range from about $150 for the smallest models to $320 for 7-gallon models. Recovery rate depends on wattage and the efficiency of the heating elements. Both 120-volt and 240-volt models are available. A 120-volt model can be easier to install if its electrical requirements allow it to be plugged into a conventional electrical outlet located under the sink. Note that these electrical requirements depend upon the wattage of the unit. In most cases, a small 1400-watt unit can be plugged into a standard outlet protected by a 20-amp circuit breaker. But many higher-wattage units require a dedicated 30-amp circuit breaker and 10-gauge electrical wire, which is larger than what is typically provided to serve a garbage disposal. 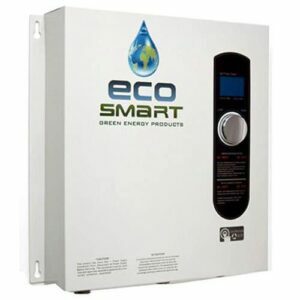 Top-rated electric tankless water heater has enough flow to handle multiple showers in a very cold climate. The 240-volt models heat faster and more efficiently—a requirement for demanding high-flow models. But most homes don’t have 240-volt circuits available near the sinks. Bottom line: Before buying a point-of-use water heater, be sure your home has the necessary electrical hookups and circuits to serve it. You can shop for point-of-use water heaters online at Amazon.com.